Ellen Bowman is teaching and Rhoda is interpreting. On April 24, 2015 HEART hosted a Mother-Daughter Tea with 29 WEEP women and 48 daughters. The tea was facilitated by Ellen Bowman – HEART’s great friend and partner. 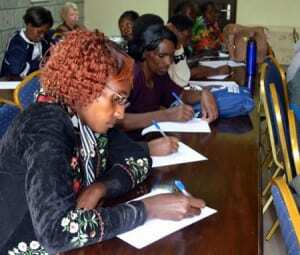 This was a special day of marketing and branding training for the Nairobi WEEP ladies who are emerging entrepreneurs. The training focused on various aspects of marketing, improving product quality and customer service. “Customer is Boss” was the take home lesson which would later translate into more business for these women. Their daughters aged 11-17 years were not left out and had a special training session on maturation. They were trained on how to stand tall, and speak with confidence. 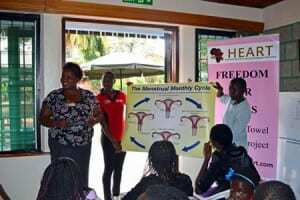 The health education session that included: the menstrual cycle, personal hygiene, HIV/AIDS prevention and a demonstration on how to use the sanitary towels and dispose of properly. The girls were happy to receive education and the booklet to continuously remind them of what they were taught. At the end of the day the WEEP women had an opportunity to display and sell their products to HEART and were able to apply the skills taught during the training. Their daughters each received a year’s supply of the Freedom for Girls (FFG) packages through the support of Donna Bowman Burgess. To end the day, Vickie and Ellen had a chance to take pictures with the WEEP women and their daughters.